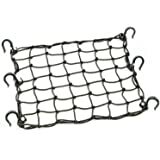 Sold by Leather Xtreme and Fulfilled by Amazon. Gift-wrap available. 5.0 out of 5 starsThey work! 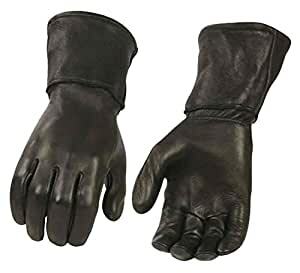 Thin and supple, yet I wore on a 70+ MPH ride to work in 39 degree F weather this AM, and was never once tempted to take my hands off the grips and hide them behind the windscreen. 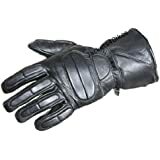 Be sure to put them on properly; 1) put on jacket and snug up wrists, 2) flip gauntlets inside-out, 3) put on gloves and snug up fingers, 4) flip gauntlets down over the sleeves, creating a windproof barrier. I wanted to love these, I wanted them to be warm and pliable and wonderful. I was only half right. 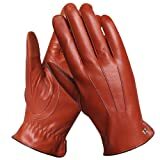 They are pliable, because they're deerskin, which makes them smooth and supple. They are not warm, however, as can be evidenced by a ten minute ride in 50 degree weather, and cold fingertips. I even have a batwing which deflects most of the air off my hands entirely. 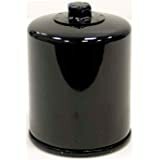 The only thing that would make these warm, I think, would be liners and perhaps heated grips and bark busters (or similar wind blocking tool). 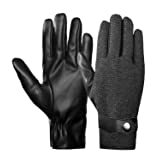 Comfortable and warm with room for dexterity, these gloves fit my riding needs perfectly. I have heated grips, and with most heavy winter gloves you can't even feel the warmth due to how insulated they are. 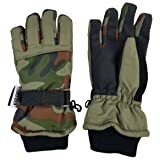 These gloves are warm enough to keep the top of your hands out of the cold, but thin enough to allow the grips to heat up your palms and fingers. I rode in 20 degree weather for about 2 hours with them on. By the end of the ride, I was cold. My fingertips and knuckles were cold. My palms and most of my hand remained warm from the grips. I rode about an hour in 36 degree weather and my hands were completely toasty with the grips on. I assume with no heated grips these gloves would not be great below this temperature. First, the good. My purchased arrives 3 days before the estimated delivery. Second, the exterior buckskin gloves were very soft and comfortable. Now, the bad. 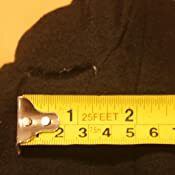 I put my hand into the first glove and found a large tear in the lining at the base of the thumb. I don't know if these gloves had previously been returned or not. If they were, shame on the seller for reselling them. If not, shame on the manufacturer for not having the necessary quality control to prevent these from leaving their facility. 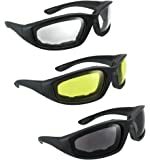 I would have returned them for an exchange but I had an immediate need for them and could not wait for a replacement. I will try and repair the tear as best as I can. Needless to say, I am disappointed in this purchase. 5.0 out of 5 starsNice gauntlets. 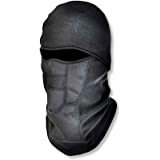 They are very nice although I haven't had a chance to use them they fit very well and are very warm for now but I will have to wait until this winter to see how they do in the cold, cold. 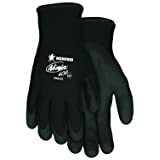 I have had a chance to use them several times in the cold, a couple time at night at 38º F and they keep my hands very warm. 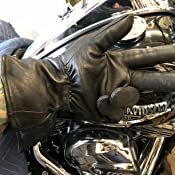 I would recommend them to anyone is looking for a pair of leather gauntlet motorcycle gloves. There is no way you you can get a better price. 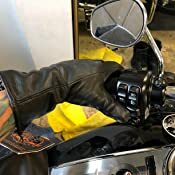 I was hopeful of these being my first leather pair of gloves, It was 49 degrees outside this morning here in north florida, I bundled up putting on my gear and the new gloves thinking I should be nice and warm! But alas... 10 minutes into the ride my fingers were quite chilly, Not freezing as the gloves did provide air protection but very little actual insulation resulting in very very cold fingers ten minutes into my trip. But hey... they look good! And I didn't lose throttle control. 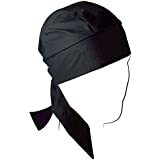 Very thin, good for mild weather but certainly not thermal nor winter riding gloves. 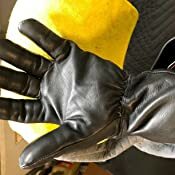 Gloves are good quality and fit fine. Problem is anything under 40 degrees and my fingers froze. That's just walking around, not on a bike. I have worn them for over a month and am disappointed with my purchase. They look good, but they do not keep my hands warm.